Here are some shots i took yesterday at a few polling stations around Eldoret.It was so hot, but people braved the heat and queued in order to vote. By and large it went smoothly in some stations, though in the hospital ward, it was quite inefficient with lines snaking around the corner. There was alittle tear gas in the air from fracas on the previous day but people still soldiered on. Other women in Rift Valley made it through and might constitute a chunk of women MPs in the next parliament. This entry was posted in Africa, Kenya, politics by Juliana Rotich. Bookmark the permalink. Great shots Juliana! I’ve been following the news via you and KenyanPundit, but for some reason can’t access Mentalacrobatics. excellent pichas! nice visual reporting. Wow! Nice pictures kweli. You are already a professional. 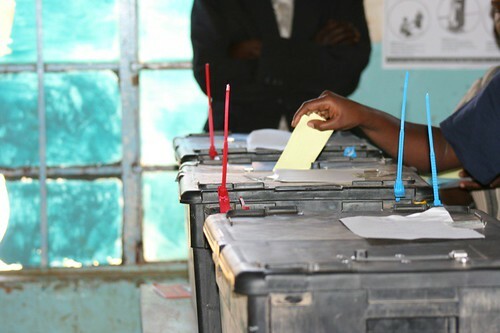 Would you mind tagging the pics and your election posts with the kenyaelections07 tag please? That is a wonderful photoset, Juliana. I’m following the updates on the KP and Mental Acrobatics as well. Hope you’re okay. You dont have to be a political genius to see the obvious rigging that took place. As much as they could not be absolute indicators, the following points should open your eyes. 1) Opinion polls for 15 months before election have always shown Raila is leading. 2) The overwhelming voting out of Government ministers and MPs allied to the government.Nothing can be more indictive. 3) Election of about about 50% of MPs on the ODM ticket. 5) Major discrepancies presented by ODM with documentary evidence on Tallies at the ECK and the respective different constituencies. 6) Ratification of such claims by the credible EU observers as well local observers (Kedof). 8) The recent breaking of ranks by 4 of the ECK commissioners claiming a possibility of their collegues altering the presidential votes. 9) The brave claim by one of the ECK officials that he witnessed gross manipulation of the figures at the ECK centers. 10) The lack of FORM 16A (document validating figures from returning officers at the constituencies) for 48 constituencies (majority of which are among the disputed ones) to support the presidential vote tally presented to teh ECK. 11) The quick and quiet swearing in ceremony that was held at state house a few minues after the results were announced.It felt like a sleek robbery. Shops and supermarkets are closed. No supply of basic grocerries. NO milk, no bread no vegitable. Food stock is running out at home. Its crazy. We cant leave the house coz the violence right our side my house is just like a village warriors action movie. We cannot get cell phone airtime. Communication is almost out. The media is being gagged. Information of events in other areas or of our loved ones is getting scarce. – hi everyone, in Eldy, lots of tension, some people sought refuge in churches and police station, will upload pics shortly if i can. -Houses were burned in the last two days, things seem calmer now, though in Langas, people are still fighting and supposedy more killed. Talked to a guy who lives there, says the leaders need to come there, one rep of the folowing languages: Luhya, Kalenjin, Kikuyu, put up a white flag and appeal for peace. Radio appeals do nothing to calm that particular part of Eldoret. In addition people’s heads are supposedly lying about and it is terrible. -Govt spokesman’s words seem very hollow considering the situation on the ground. Long queues at Uchumi in Eldoret, some parts of town completely deserted. Masses of people in police station and churches.